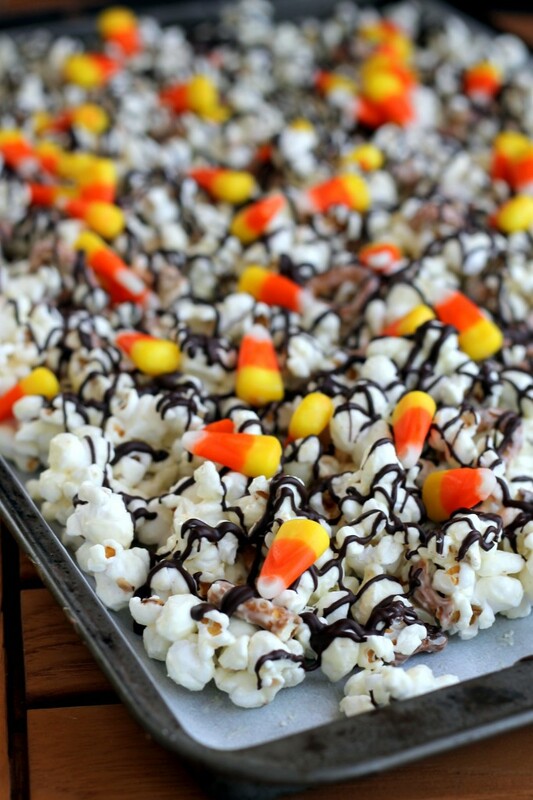 This White Chocolate Candy Corn Popcorn is tossed with pretzels, candy corn, white chocolate, and a drizzle of dark chocolate for a Halloween treat! How in the world is it already almost Halloween? I swear, it was just New Years. I may or may not still accidentally write 2011 on things. Now, when I go to Target, I’m surrounded by cobwebs, cauldrons, and costumes. And Christmas stuff?! I’m not ready for that yet. Let me get through fall first, please, and thank you very much. I am so not ready to start planning out my holiday cookies yet. Back to Halloween: costumes. If there’s one thing I’m terrible at, it’s coming up with costumes. I’m always a walking cliche on Halloween…Snow White, Fairy, 70’s Chick. I’ve been it all. No, you can’t see pictures. Halloween-themed dessert though…those are fun. Those I can do. I rarely post holiday-themed dessert recipes, because I usually don’t think about it until right before the holiday, when it’s too late. Oops. Sorry. This year, though, I’m on top of it! This popcorn is a dessert/snack – AKA eat it whenever you want and it will be socially acceptable. 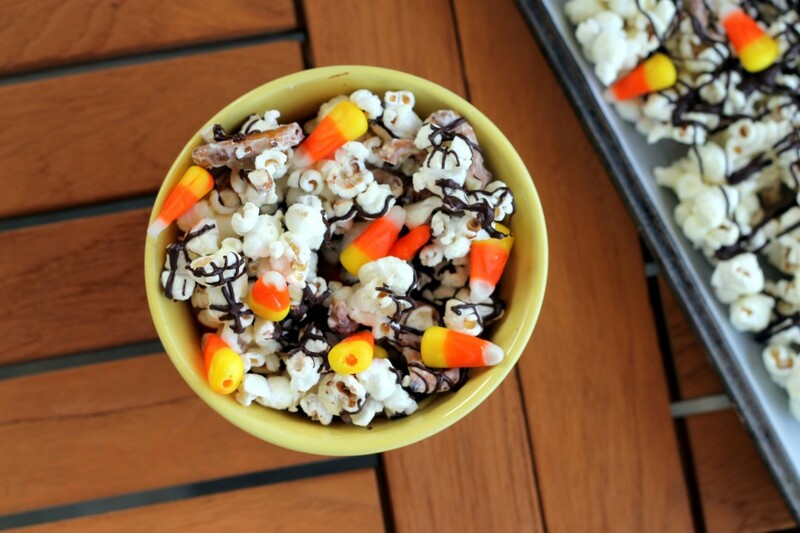 This popcorn is freshly popped, mixed with crushed pretzels, covered in white chocolate, drizzled with dark chocolate, and tossed with candy corn. Ain’t nothing wrong with that. Eat it fresh, getting chocolate all over yourself, or let it harden up in the fridge and snack on it cool! Or, put it in adorable little Halloween gift bags, tied with cute little Halloween ribbons and give them to your friends if you’re way more creative and crafty than I am. Any way you serve it, I hope you enjoy it! Line a large baking sheet with parchment paper or foil, grease, and set aside. In a small saucepan, bring 1-inch of water to a simmer. Put the white chocolate in a large heat resistant bowl. Place the bowl over the saucepan full of water, making sure the water doesn't touch the bottom of the bowl, and stir the white chocolate constantly until it is fully melted. Remove bowl from the heat. Add the popcorn and the broken pretzels to the white chocolate and toss until the white chocolate is evenly coating the mixture. Spread the popcorn mixture onto the prepared baking sheet and place in the refrigerator for about 15 minutes, or until the chocolate has hardened slightly. In a small bowl, melt the semi sweet chocolate chips in the microwave, stirring every thirty seconds. Once melted, transfer the melted chocolate into a small Ziplock bag. Remove the popcorn mixture from the refrigerator. Snip a tiny corner off the Ziplock bag and drizzle the dark chocolate over the popcorn mixture in whatever pattern you'd like. Place back into the refrigerator for about 20 minutes or until the chocolate is completely hardened. Remove from refrigerator and break up the popcorn slightly. Toss in the candy corn and place in the serving bowl. Serve immediately. 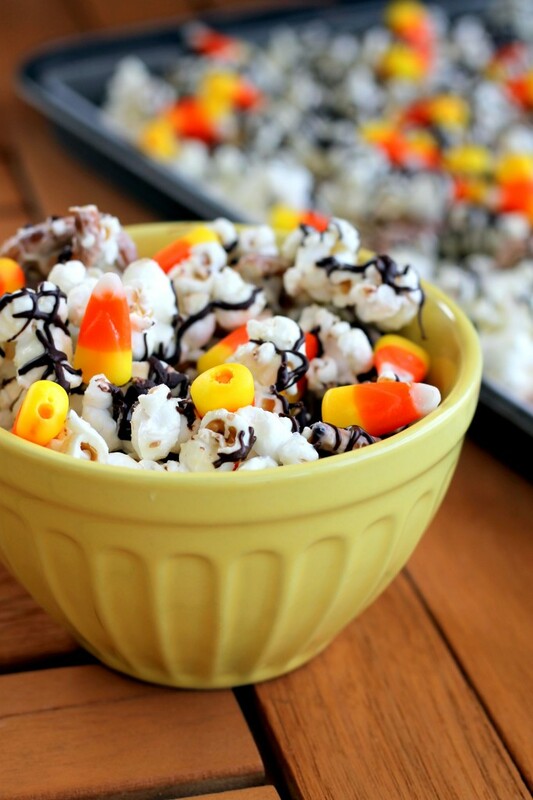 This popcorn is fun and perfect for a Halloween party. I’m still trying to decide if we are going to pull out all the crazy decorations this year. If we do, I will have to make this recipe!